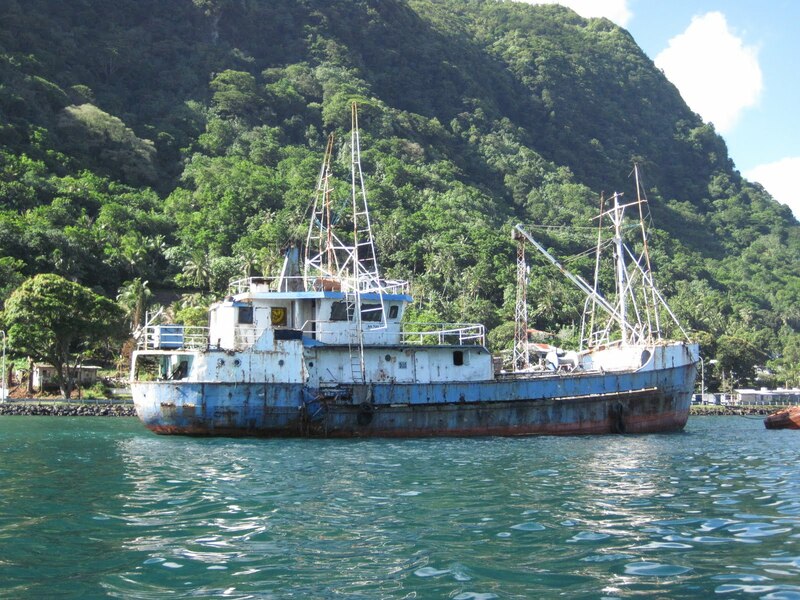 Things aren’t necessarily easy for cruisers here in Pago Pago. Take our friends, Rolande and Angus, aboard the cutter, Periclees. They just arrived late yesterday afternoon from Suwarrow Atoll, where we saw them last. Angus bought the bare hull of Periclees and did all of the interior, rigging and systems himself. They’re from Canada and have been out sailing for quite a while. While we often keep to ourselves, Rolande and Angus are very popular and seem to have a ‘date’ almost every night. From our point of view, Pago Pago would be almost perfect for them yet they left the harbor within 24 hours of arriving. Last night was rough for them. At 0300, they were reanchoring their boat as the wind had picked up and was gusting to the mid-20s (not unusual). They made several attempts and finally seemed to get their anchor to stick but I know from experience that it’s hard to get a good night’s sleep after your anchor has dragged. The thought will haunt you relentlessly, “Will it drag again?” as you struggle to capture some elusive sleep, all the while knowing damn well that you’re up for the balance of the night, regardless of how many justifications you come up with that you’re secure. This morning, Periclees abandoned the idea of anchoring and grabbed the only mooring in the bay that was available. There isn’t much information on American Samoa for cruisers but what little there is is shared. In that information is a mention of the moorings but cautions that there is no known maintenance on them. So now Periclees is kind of between a rock and a hard spot: Their anchor won’t hold and they’re attached to a mooring of unknown security. Besides that, the mooring is very close to Alice, a rusted hulk of a small tuna seiner (about 100’ long) that looks like it hasn’t been sailed for years, that’s tethered to it’s own mooring. Now Periclees is between a rock, a hard spot and Alice. A group of us went out for dinner tonight. Besides Rutea, there was Aeolis, Savannah and Down Time. From where we were sitting, we could see Periclees leaving the harbor and we understood, without saying anything to each other, how they must have felt, leaving a destination without provisioning, exploring or relaxing. Perhaps they’ll have better luck in Apia on Western Samoa. We wish them fair winds and calm seas. We linked your blog to Pago Pago on Good Anchorage for fellow mariners to have local knowledge & reviews.